For the past nineteen months or so, I have been as tied to the earth as an earthworm or an anvil. Our house has three levels, but as far as I have been concerned it has had only one — and that level has not contained a real bedroom or a full bath. I have looked up as Fluffy has gone upstairs to take his daily shower or do the other things I used to take for granted, but those things were beyond me. When I graduated from physical therapy nearly a year ago, I did not pass off stair-climbing because our stairs were far beyond my ability to ascend. My physical therapist said I would eventually be ready for stairs, but I was not at that point yet. I would watch as other patients struggled up the five-stair riser at the therapy center, and would then celebrate their ascension, and wonder when that would happen to me. There was no way I could lift my feet far enough to scale one stair, much less fifteen of them. And even if I could, I needed two stair rails and our staircase only had one. 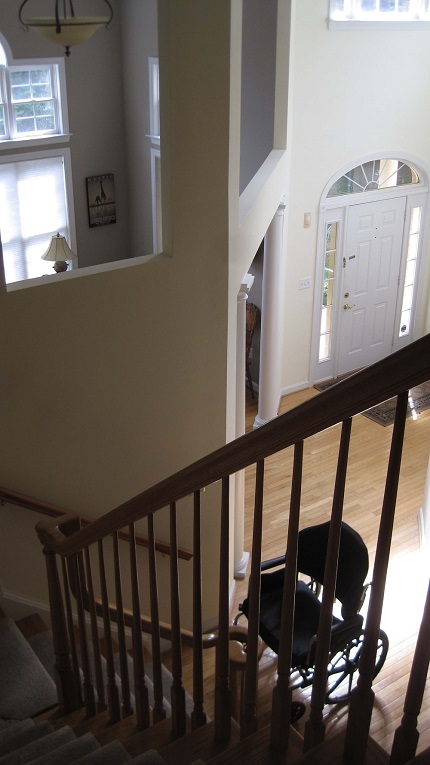 Anyway, the lack of a handrail on both sides of our staircase kept me trapped on our main floor. Even after I started looking longingly up to the second floor, I was trapped because it was my hands that would pull me upstairs, not my feet, and I needed to pull myself up with both hands. Also, we have an incredibly wide staircase. It isn’t Gone with the Wind wide, but it’s wide enough. I didn’t think I could hold on to both sides at the same time. I was beginning to think I was trapped on the main floor of our house forever, but my feet started having other ideas. My feet have been having lots of ideas for the past year and a half. My neurologist, Dr. Cintron, told me this was going to happen. He told me from the first to listen to my feet. He said all the exercise in the world wasn’t going to help until my nerves were ready. The nerves in my feet would tell me when it was time, he said. And this is one doctor who knew what he was talking about. My nerves have said in their own little nervy voices that it was time to do so-and-so, and I have listened. For one thing, if I don’t listen, they have a way of making me sorry. Nerves know all about inflicting pain. But I digress. My nerves started saying one word. Up. They said it often. They said it forcefully. I didn’t know how I could get there, but I knew my feet were ready for those stairs. I had been practicing with some exercise steps and could go up and down one step 15 times with both feet. But was I ready to tackle the real stairs? I knew I needed to try. Fluffy was more than willing to help me. At the time, we didn’t know about the rule against having two handrails. Frankly, we wouldn’t have cared anyway. It’s our house, and it’s a stupid rule. If we need two handrails, we’re going to have two handrails, or three or four. If the police get upset about it, they can take it up with my feet. 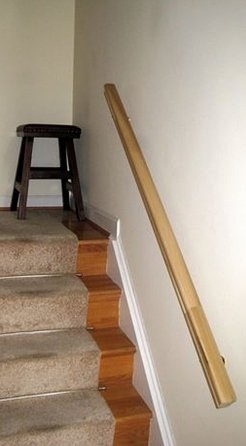 So Fluffy went to Lowe’s and purchased wood for some handrails. He cut the wood, and he stained the wood, and he finished the wood. He installed the hardware, and he attached the first rail for me to get up the first five stairs to the landing. He figured that was as far as I would need to go, at least for the time being. Little did he know my feet had their own ideas. My feet took one look (virtually) at the stairs, they hopped up to the landing, they took a rest on the bench just long enough to help my lungs catch my breath, and then they said one more word. Up. This was just a tad obnoxious, because Fluffy had not yet finished the second rail to get me up the last ten steps of the staircase. He had thought that was months into the future. The bench at the landing of our steps. Since that picture was taken, the railing has been stained to match the stairs. So off Fluffy went back to his workshop to start on the second rail. He did some more cutting and sawing and sanding and staining. He screwed hardware into studs and made everything sturdy, because after all I was going to be pulling myself up those last ten stairs as much as walking up them. When it was all done, my feet clambered up to Base Camp, which is the bench on the landing after the first five steps. They surveyed his work on the second staircase and pronounced it good. Up, they said, and up I went. Frankly, it wasn’t difficult at all. After all, one could argue that my arms were doing a whole lot of the work, even though my feet were the ones giving the orders. So there I was, for the first time in a year and a half, sitting at the top of our stairs and surveying our second floor. Fluffy even made it authentic for me. Back at the therapy center when people would make it to the top of the practice stairs, they rang a bell and everybody clapped. After all, it was a big achievement. So Fluffy put a chair at the top of the stairs, and a bell next to the chair that I could ring when I got to the chair. I rang the bell, Fluffy clapped, and then he took a picture. Never mind that I was in my pink polka-dot nightgown at the time. Some things have to be preserved for posterity. Never mind that I was in my pink polka-dot nightgown at the moment when Fluffy took this picture. Some things have to be preserved for posterity. I haven’t just gone upstairs once and called it good. These days I usually go upstairs five days a week. I don’t do it on temple days, and I don’t do it on Sundays, but I try to go upstairs every morning as soon as I’ve washed my hair. Going upstairs and viewing the world from that lofty perch is good for me. It reminds my body, and especially my brain, that upstairs is where I’m supposed to be. The view from the top of the stairs. Looking at that empty wheelchair down below tells me where I used to be, and the vantage point is where I’m supposed to be. I revel in the upstairs of our house. I remember the beauty of my office, and how lovingly it was crafted by friends who wanted to create a sanctuary for me to have a place to work. I can’t wait to work up there every day again. But even going up there every day to help get it ready for eventual occupancy has me excited to resume my normal life. We all have things in our life that seem impossible — mountains that seem as big for us as climbing those fifteen steps to the second story of our house seemed to me only a few months ago. What it takes to reach our goals is to listen to that inner voice that tells us what we are supposed to do. For me, that inner voice consisted of one word: Up. For you, that inner voice may say, “Go back to school,” or, “It’s time to get a better job,” or, “You need to work on improving your marriage,” or something else entirely. All these things can be the mountains in your life. All these things can be just as frightening to you as the stairs were to me, but they are just as attainable. God does not give us any challenges that are impossible to overcome. With every task we take upon us, there is a way to accomplish it. There are people here to help us, and I suspect there is an unseen cheering squad on the other side who are offering support we do not even know about. If you do not listen to your inner voice, nobody will be disappointed. But what books will remain unwritten? What seas will be uncharted? What relationships will remain unmended? What opportunities will be missed? Don’t disappoint yourself. Don’t disappoint the cheering squad that is rooting for you on the other side. Climb your mountain. 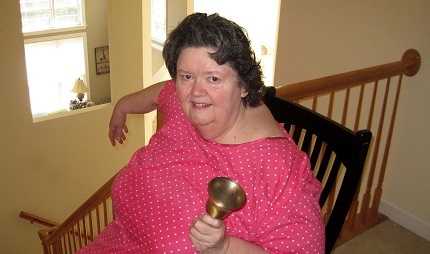 Ring your bell. Take your picture, even if you’re wearing a pink polka-dot nightgown and look like a real dweeb in the photograph. Some things have to be preserved for posterity.